Restlessness has set in. My bag is no longer functioning to my standards. I am once again on the quest. easy access into the bag for my wallet, etc. Currently I’m using this messenger bag which has worked great and was the right price, but lately all my stuff falls out when I set it down. That’s no good. Prior to that I used this style back pack. Mine is a softer orange with olive trim . My only complaint is that every time I needed to reach my wallet, I had to swing the backpack off my back. With a heavy coat on in the winter, a backpack can become cumbersome. Isn’t this just fun? The Artist Canvas Messenger Bag from Timbuk2 ready for paint. It is only available in size Medium, and I’d really love a small. The price is quite a jump from my cheap messenger bag, but my husband has had one of these bags for almost a decade and it is still in great shape. Would I really want the same bag for a decade? Ooo, I just found a gooder made of repurposed rice paper, recycled aluminum and rubber made by Keen. Just had to add it to the mix. I think that you should go for the Timbuk2 bag. You already know about quality, whether your stuff will stay in it, and the style. You could easily save a lot of money over buying a couple of bags that don’t work. The added bonus is that you can paint it and really make it your own. I currently have on the way a Backpack pattern. I find that kids’ backpacks are made for one year of school at the most and most are way too big. We are going to have fun selecting fabrics for our and I will be sure that the kids won’t tip over when they put them on fully loaded. Shoot, I may even make myself one. 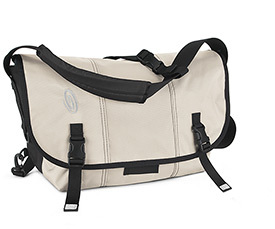 type in messenger bag or laptop case and you will get some really cool stuff! Thanks for the suggestion. The middle one is just like my bag but with a very cool print on the front. I had good intentions to do something similar when I bought the bag, but alas, it is still plain. Can’t help you. I have carried a wallet on a string for about 20-years because (1) my ex-husband always asked me to put things in my purse and I soon was toting more of his things around than my own (2) I left my purse places all the time ~ a string is attached and (3) I decided I looked okay without makeup and that hair only needed to be combed once a day. I didn’t need that much. I did update this year to one that had a handy pocket for my cell phone. I generally open the hook that keeps the string connected to my wallet and attach my keys.